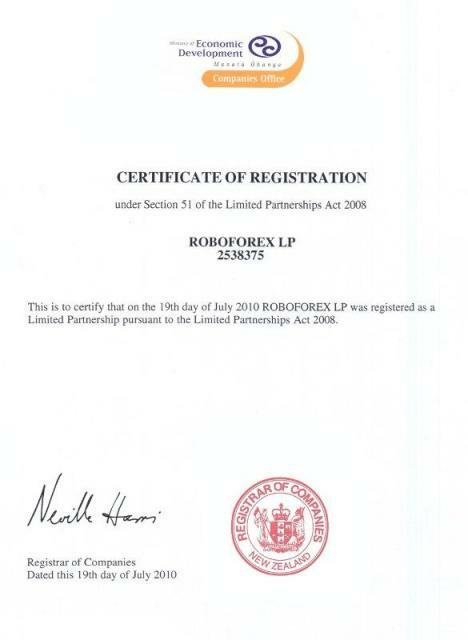 RoboForex is registered in New Zealand, registration #2538375. The company is a partner of several leading brokerage software developers and applies the STP model with the Bridge Technology to work with its Prime Broker and execute customers’ orders in Non-Dealing Desk mode. The minimum deposit requirement is $10. You can choose any leverage from 1:1 up to 1:500 depending on the risk management strategy you use. Before live tradingl, you can practice with an unlimited demo account. The security of the deposit is protected by SSL-certificate from VeriSign and e-mail/SMS confirmations. Roboforex is a member of Financial Services Complaints Ltd. FSCL is an independent not-for-profit organization, which provides dispute resolution services to participating financial service providers and their clients. External Dispute Resolution Scheme was approved by the Minister for Consumer Affairs of New Zealand. RoboForex is also registered in the FSPR (Financial Service Providers Register) as a financial services provider. Fast execution, no requotes and, if the market conditions are normal, without slippage. We believe that we’ve created the best possible conditions for MetaTrader4 trading platform and 4-digit quotes with fixed spread, which are so popular among traders and widely used by trading robots. The account conditions include low spreads, instant execution in Market Execution mode, absence of Limit & Stop Levels, high liquidity. These type of accounts are currently available for MetaTrader4 (MT4), MetaTrader 5 (MT5) and cTrader trading platforms, with a level of 1:200 and the ECN Trading Conditions. This forex account type is intended for experienced traders who require specific conditions to use trading strategies. The RoboForex offers Fix-Standard (Forex Mini), the account that features a fixed spread, 4 digits after comma, and the Instant Execution mode. This type of forex trading account is the best solution for trading experts programmed to work with the fixed spreads. An account for forex beginners. The main feature of this forex account type is to use cents as an accounting unit for transactions. For example, cent account of 1,000 cents is equal to 10 US Dollars or Euros and is a more convenient and affordable amount of money to make first steps. Thus, a beginner has an opportunity to make trades using real money without risking losing a large amount of it. Pro-Cent (Forex Micro) forex account is a specific type of trading account intended for those clients who would like to try real trading conditions at the interbank market. The RoboForex is counterparty to the transactions on these accounts, but the client's order is executed as if the orders are passed on to a Prime Broker by means of a Bridge. Thus, using a specific Engine developed by RoboForex, we allow our clients to test "real Forex" without involving large amounts of money. Virtual training demo accounts are the optimum alternative for both Forex newbies and professional traders who may use them to test efficiency of their forex advisers and profitability of market strategies. The speed of order execution, trading conditions, and other functional parameters of all types of demo accounts on MateTrader4 and MateTrader5 platforms fully correspond with the trading conditions of the real accounts RoboForex. Regulated : Yes, New Zealand, FSP246525. Accounts : Demo, Live: Fix-Cent (Forex micro accounts), Fix-Standard (Standard forex mini accounts), Pro-Cent (Forex micro accounts on Pro conditions), Pro-Standard, for professional traders: ECN-Pro NDD and ECN-Fix NDD.